And I'm going old school and sticking to the previous saying. It is clear that to meet the needs of higher education and today’s learner, the NGDLE must support a much wider range of functionality than today’s LMS, including different instructional modes, alternative credit models, personalized learning, robust data and content exchange, real-time and iterative assessment, the social web, and contemporary software design and usability practices. The policy and cultural context at our colleges and universities must also adapt to a world in which all learning has a digital component. As I'm making an ill-timed trip from sunny California to snow-ravaged DC for a reduced-attendance meeting, I should at least lay down some of my thoughts on the subject in writing2. There is potential confusion of language here by implying NGDLE as an environment to replace today's LMS. Are we talking about new, monolithic systems that replace today's LMS but also have a range of functionality to support new needs, or are we talking about an environment that allows reasonably seamless integration and navigation between multiple systems? Put another way, investing in what? 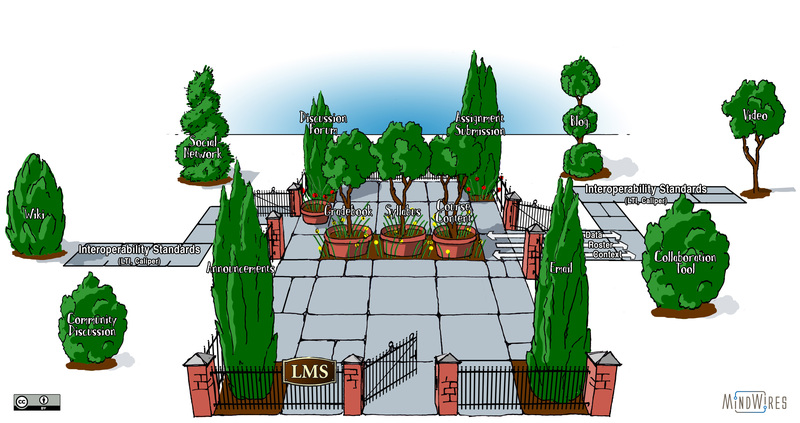 To get at that question we should consider the current LMS market. Unlike five years ago, market dynamics are now leading to systems that better meet the needs of students. Primarily driven by the entrance of the Canvas LMS, the end of the Blackboard - Desire2Learn patent lawsuit, and new ed tech investment, today's systems are lower in costs than previous systems and have much better usability. Canvas changed the standard of what an LMS can be for traditional courses - competitors that view it as just the shiny new object and not a material difference in usability have done so at their own peril. Blackboard is (probably / eventually / gosh I hope) releasing an entirely new user experience this year that seems to remove much of the multiple-click clunkiness of the past. Moodle has eliminated most of the scroll of death. Sakai 10 introduced a new user interface that is far better than what they had in the past. It seems at every school I visit and every report I read, students are asking for consistency of usage and navigation along with more usable systems. This is, in fact, what the market is finally starting to deliver. It's not a perfect market, but there are real changes occurring. to an open garden approach that allows the coordination of the base system with external tools. Largely due to adoption of Learning Tools Interoperability (LTI) specifications from IMS Global, it is far easier today to integration different applications with an LMS. Perhaps more importantly, the ability to move the integration closer to end users (from central IT to departments and faculty) is getting closer and closer to reality. Michael has also written about the potential of the Caliper framework to be even more significant in expanding interoperability. The LMS is not going away, but neither is it going to be the whole of the online learning experience anymore. It is one learning space among many now. What we need is a way to tie those spaces together into a coherent learning experience. Just because you have your Tuesday class session in the lecture hall and your Friday class session in the lab doesn’t mean that what happens in one is disjointed from what happens in the other. However diverse our learning spaces may be, we need a more unified learning experience. Caliper has the potential to provide that. At the same time there are a new wave of learning platforms designed specifically for this latter category. I have started to cover the CBE platforms recently, as Motivis, Helix, FlatWorld, LoudCloud Systems, and others have been introduced with radically different features and capabilities. At e-Literate TV we are learning more about adaptive and personalized systems such as ALEKS, Smart Sparrow, OLI, Cerego and others that design around the learning. If you look at this new wave of learning environments, you'll see that they are designed around the learner instead of the course and are focused on competencies or some other form of learning outcomes. In a sense, the market is working. Better usability for traditional LMS, greater interoperability, and new learning platforms designed around the learner. There is a risk for NGDLE in that you don't want to screw up the market when it's finally moving in the right direction. The primary benefits of today's LMS remains administrative management of traditionally-designed courses. 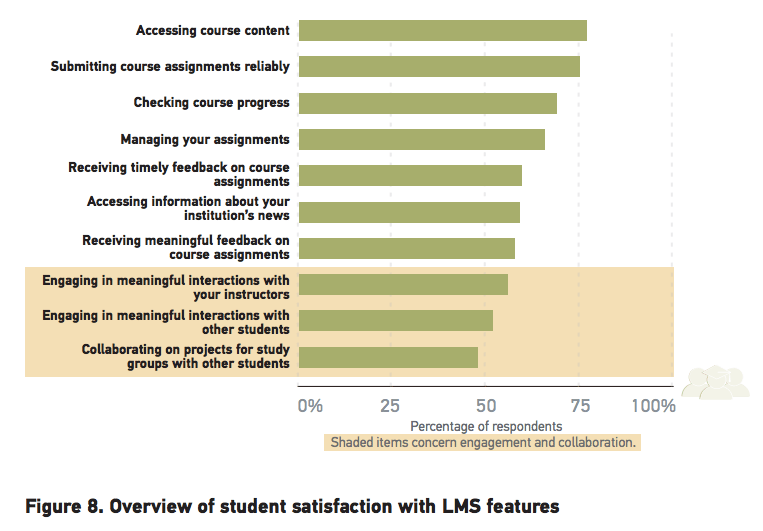 From last year's ECAR report on the LMS, faculty and students rated their LMS satisfaction highest for the basic administrative functions. Opponents of the traditional LMS are right to call out how its design can stifle creativity and prevent real classroom engagement. 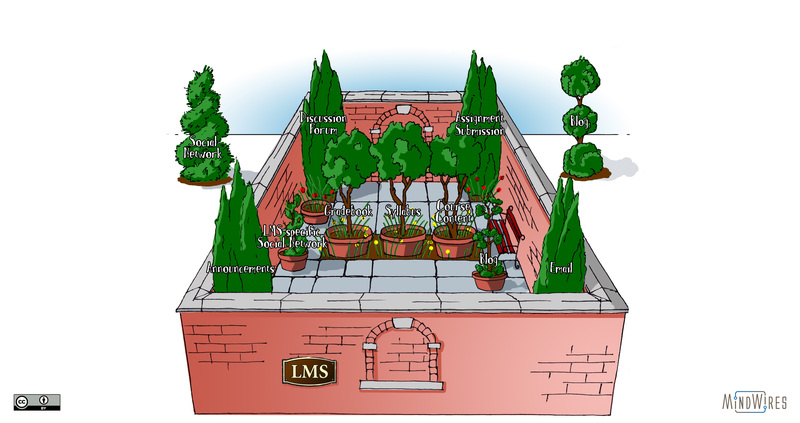 Almost all capabilities of the LMS are available on the free Internet, typically in better-designed tools. The community has discussed the need for direct teaching and learning support for years, yet most courses only use the LMS for rosters, grade book and document sharing (syllabus, readings, assignments). The market changed en masse to call their systems Learning Management Systems in the late 2000s, but the systems mostly remain Course Management Systems as previously named. Yes, some schools and faculty - innovators and early adopters - have found ways to get learning benefits out of the systems, but that is secondary to managing the course. New educational delivery models such as competency-based education (CBE) and personalized learning require a learner-centric design that is not just based on added some features on top of the core LMS. It is worth noting that the new learning platforms tend to be wholesale replacements for the LMS in specific programs rather than expansion of capabilities. The real gains in learner-specific functionality have arisen from applications that don't attempt to be all things to all people. In today's world it's far easier to create a new web and mobile-based application that ever before, and many organizations are taking this approach. Any attempt to push platforms into broader functionality creates the risk of pushing the market backwards into more feature bloat. I won't go into investment strategies for NGDLE, as that is the topic for group discussions today. But I think it is worth calling out the need to support two seemingly incompatible needs. Given the very real improvements in the LMS market, we should not abandon the gains made by institutions and faculty that have taken ~15 years to achieve. The market should not just evolve - new educational models require new ground-up designs, and we need far more emphasis on learning support and student engagement. Is it possible to eat your cake and have it, too? In my opinion, our best chance is through the encouragement and support for interoperability frameworks that allow a course or learner hub / aggregator - providing consistent navigation and support for faculty not looking to innovate with technology - along with an ecosystem of true learning applications and environments. This is the move to learning platforms, not just as marketing terms but as true support for integrated world of applications.